Never mind what all the symbols mean right now, just play "spot the difference" and bear in mind we're ignoring something called diphthongs for now. Now, you might think, ok, but surely the consonants will be much more similar. In the words of Dirty Harry, are you feeling lucky? See what I'm driving at? At this stage of learning, even without understanding what all the symbols mean, it's is obvious that Gaelic and English have vastly different sound inventories. In actual fact, you've chosen to learn a language with one of the most complex system of sonorants (L N and R) anywhere in the world. Daunting? Perhaps, but be proud of it. And it IS learnable, trust me. 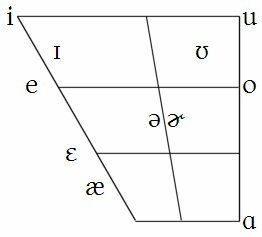 English doesn't have many clear vowels (instead it has those wonky ɑ ɒ ʌ ʊ thingies), Gaelic does (a e ɛ i and so on - linguists call these cardinal vowels). English doesn't have a long/short vowel distinction, Gaelic does. I mean that in the sense that on the whole, vowel quality is more important in English than length. For example, the vowels in the words ship and sheep are different in two ways, the second one is indeed longer but also, the quality changes from [ɪ] to [iː]. English has one L, N and R, Gaelic has three distinct sounds for each. English has two dental fricatives, neither of which is much help in Gaelic. English has a [w] which isn't any help because Gaelic doesn't have it. It's a loooong list. So using English sounds/syllables to create a system of Imitated Pronunciation is not going to work - <lap-ee> and <cheen> are as far removed from the Gaelic words leabaidh and tighinn as <sing> and <oftalmolodschist> are from <thing> and <opthalmologist>. So why the IPA? Haven't I enough to worry about? Actually, the IPA is there to help make your life easier. You don't have to learn the entire IPA, just the bits you'll need for Gaelic. 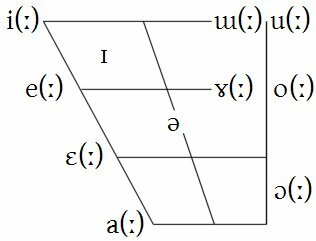 The IPA is a reliable tool to help you write the sounds of any language. It was developed by linguists for that exact purpose. True, it's not 100% perfect, but what is? That's the quick guide to most of the sguiggles (diacritics) you'll see on this site - we're not even using all of them because we're using a slightly simplified version these days. Air a tharraing à "http://akerbeltz.org/index.php?title=What%27s_wrong_with_%22imitated_pronunciation%22_and_how_to_read_the_IPA&oldid=2348"
Chaidh an duilleag seo a dheasachadh 2 dhen Dàmhair 2013 aig 13:17 turas mu dheireadh.